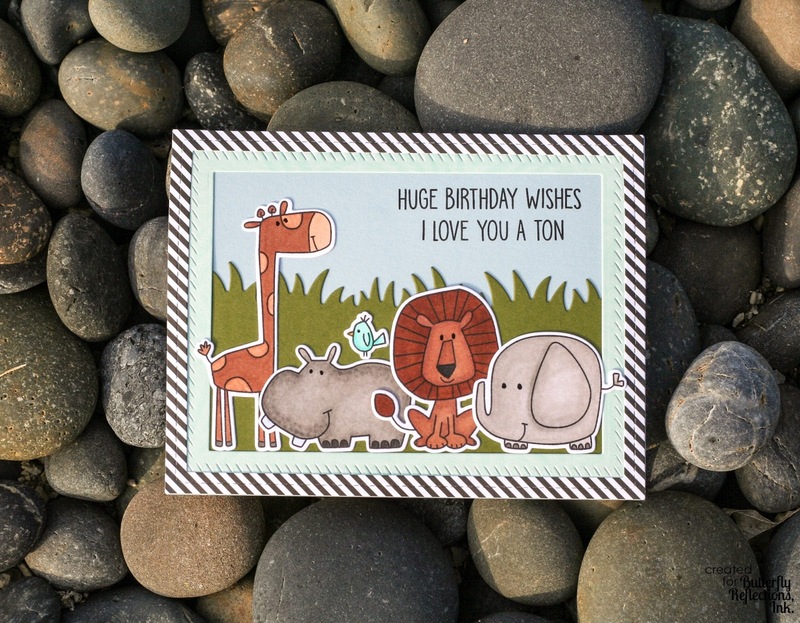 Good morning, everyone, Amy Copeland here with a clean-and-simple birthday card featuring mostly products from MFT Stamps. 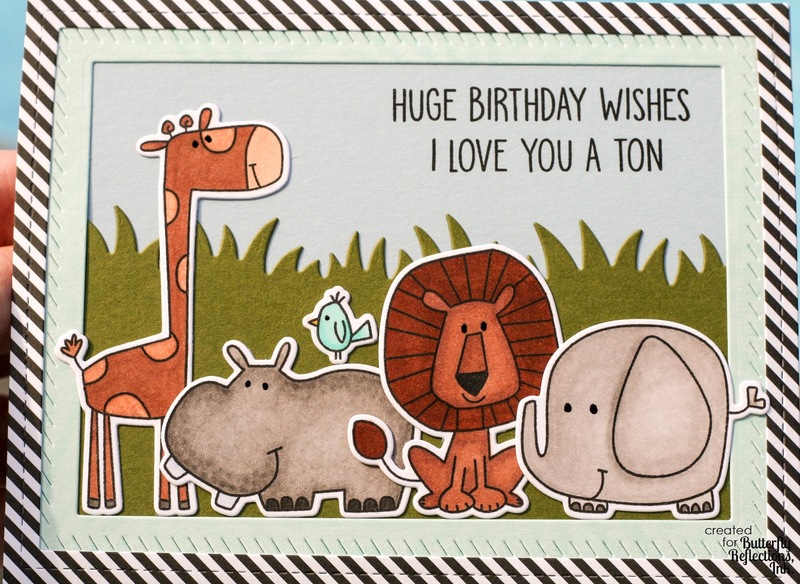 I started out by stamping the animals from Safari Friends onto smooth white cardstock with Copic-Friendly Black Ink. 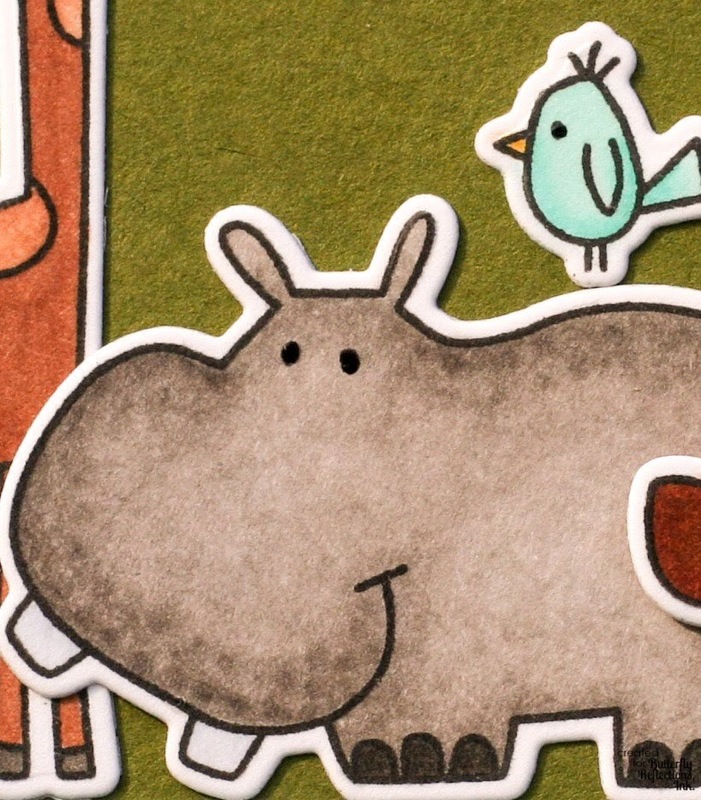 I colored them in using my Copic Markers and then used the Coordinating Dies to cut them out with my die-cutting machine. For a simple embellishment, I used my Glaze pen on all of the eyes to make them pop a bit. It's really subtle, but you can see it in real life. I moved on to the background, which was so simple. I cut an A2-sized (5 1/2" x 4 1/4") panel out of Moonstone cardstock from Lawn F﻿awn, then an A2-sized panel out of Noble Fir. I used one of the Grassy Fields dies to cut my green piece down to size. 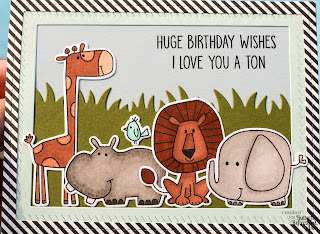 I used my MISTI to line up the sentiment in the top right corner, then stamped it twice with the same Memento ink to get a solid, crisp impression. I can't find the exact frame die that I used for the inner frame, but This One by Hello Bluebird would be a good option, as it's a little wider than the stitched frame die that I used for the outer frame. I colored the inner border with a very pale aqua Copic Marker (I believe it was BG10). I used a narrower Stitched Frame die to cut a piece of Patterned Paper for the outer frame. That wraps up my card for today--very simple, but striking! :) Hope you join me again next week and I hope this card inspired you to make your own.